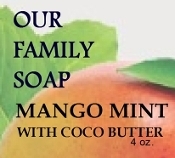 This coco butter bar soap is a trip to the tropical mango groves with a kick of mint. Refreshing scent, moisterizing coco butter and excellent cleaning without any harshness. Saponified Olive oil, Coconut oil, Palm oil, lye, natural mango mint FO, coco butter, Vitamin E.